The Syro-Malabar Church is one of the most flourishing and promising Catholic Churches today. This is the second largest Eastern Catholic Church in the world, with a population of around 3.7 million. At present it is the major community of the ancient Thomas Christians in India. According to the tradition, St. Thomas the Apostle evangelized Malabar (presently known as Kerala), the south-west cost of India. When the East-Syrian Church began to exercise control over the Indian Christians, the Malabar Church became Syrian in rite with Syriac as the ecclesiastical language. Thus it got the name "Syro-Malabar Church." "Syro-Malabar Church", as a proper name is a rather late foreign designation attributed to the Catholic Church of The Thomas Christians. The name came into force after it began to be used by the Holy See in its documents from the time indigenous bishops were first appointed in the Church towards the end of the 19th century. The word "Syro" points towards the past relationship with the East Syrian Church. For more details see Early Christians of India. The Portuguese missionaries who arrived in Malabar by the end of the 15th century, were happy to meet Christians in India in the midst of Hindus and Muslims. But they very soon noticed the differences in ritual and liturgy which were intolerable to them. With the rise of Goa as the chief seat of Portuguese political and ecclesiastical power in the East, they converted the Malabar Church, which had become Syrian, into a branch of the Latin Church and under Padroado, the colonial power of the Portuguese. For more details, see Western Influence in the Early Church of India. Pope Alexander VII sent some Italian Carmelites to Malabar in 1656, and the jurisdiction to the Propaganda Congregation was introduced in Malabar by 1661. Thus Thomas Christians were placed under dual jurisdiction, under Padroado and Propaganda Congregation. In 1787, Representatives from 84 churches assembled in Angamaly and drew up a document called Angamaly Padiyola which made a strong demand to Rome for native bishops, citing the sins of omission and commission of the foreign missionaries. The Holy See suppressed the Padroado sees of Cranganore and Cochin in 1838 and all the faithful of these suppressed sees were entrusted to the Vicar Apostolic of Malabar (under the Propaganda) who used to reside at Verapoly. It was only in 1886, the Padroado jurisdiction over whole Malabar was suppressed and a Latin hierarchy was established. The very next year, in 1887, the Syrian Catholics were Separated from those of the Latin rite and were placed under an Administrator, Dr. Marcellino O.C.D., and then, Pope Leo XIII, by the Papal Brief Quod iampridem, created for the Syro-Malabar faithful the first Vicariates of Kottayam and Trichur. But the Vicars Apostolic appointed for them were foreigners and of the Latin Rite. These Apostolic Vicars should choose from the Syro-Malabar clergy a Vicar General each to whom are given special faculties and privileges. It was in 1896, by the Brief Quae rei sacrae of the same Pope, the two Vicariates were reorganized into the three Vicariates of Changanacherry, Ernakulam and Trichur, and the Syro-Malabar Church received Vicars Apostolic of its own rite. In 1911 the Vicariate of Kottayam was recreated, exclusively for the Knanaya Christians of the Syro-Malabar rite. The spectacular progress made by the Syrian Catholic community under indigenous bishops and their sincere devotion to the Holy See were highly appreciated by Rome. On 21st December 1923 the Syro-Malabar Hierarchy was established by the Bull Romani Pontifices of Pope Pius XI, raising Ernakulam to the status of Archdiocese with the dioceses of Trichur, Changanacherry and Kottayam as its suffragans. The execution of this constitution was made on 16 November 1924, and Pallium was conferred on the Metropolitan of Ernakulam, Mar Augustine Kandathil. The Syro-Malabar Metropolitan was given the privilege of using Roman Pallium (according to liturgical laws), as a symbol of metropolitan authority and his immediate dependence on the Holy See. The second Archbishop of Ernakulam, His Eminence Joseph Cardinal Parecattil was made the first Cardinal from Kerala in 1969. In 1974 the Cathedral was elevated to the status of a Minor Basilica by Pope Paul VI. 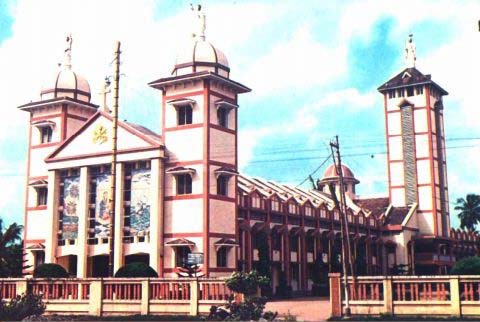 Syro-Malabar Church was erected as a Major Archiepiscopal Church on 16th December 1992 by the Apostolic Constitution Quae maiori of John Paul II (Acta Apostolicae Sedis, 85, pp. 398-399) with His Eminence Cardinal Antony Padiyara, the Archbishop of Ernakulam, as the First Major Archbishop, and Archbishop Abraham Kattumana as the Pontifical Delegate. After the death of Kattumana in 1995, all the powers of the Major Archbishop rested in Cardinal Padiyara. When he retired 1996, Archbishop Varkey Vithayathil was appointed the Apostolic Administrator as a temporary arrangement, but with the powers of the Major Archbishop. Ernakulam-Angamaly is the See of the Major Archbishop. The Syro-Malabar Bishops' Conference is now replaced with the Synod of Bishops. The first meeting of the Synod was held on May 20, 1993 at Ernakulam. The two largest Eastern Catholic Churches, the Ukrainian and Syro-Malabar, have requested the Holy See to grant them patriarchal status. Today, there are 26 Syro-Malabar dioceses (including 5 archdioceses) in India, thirteen of them in Kerala and thirteen of them outside the state. They are listed below with the year of erection in brackets. Today there are around 3675000 Catholics, 3138 parishes, 3500 eparchial (diocesan) priests and 2200 religious priests in the Syro-Malabar Church. Women religious number around 30000, and religious brothers around 980. Also, there are around 2400 seminarians. In addition, hundreds of priests and religious are working in Latin dioceses, not only in India but also in all the parts of the globe. Regarding institutions run by the Syro-Malabar Church, there are 182 colleges, 3821 schools, 262 ecclesiastical institutions, 581 medical institutions, 445 technical institutions, 917 charitable institutions and 1031 other institutions. Concerning liturgical disputes in the Syro-Malabar Church, see Syro-Malabar Liturgy.